This post was guest authored and contributed by Suresh Mohan. 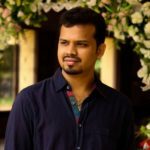 Suresh is the Product Manager for PDF Viewer at Syncfusion Software where he specializes in desktop and mobile app development. Probably the most popular document format used for sharing content across various applications and operating systems is a PDF (Portable Document Format). 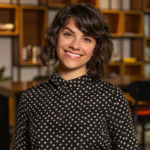 As a Xamarin developer, you may need to display PDF documents like invoices and reports within your Xamarin applications. The PdfRenderer class in Android and CGPDFDocument class in iOS can be used to display PDF documents by converting each PDF page into an image, then displaying the images within an image viewer. 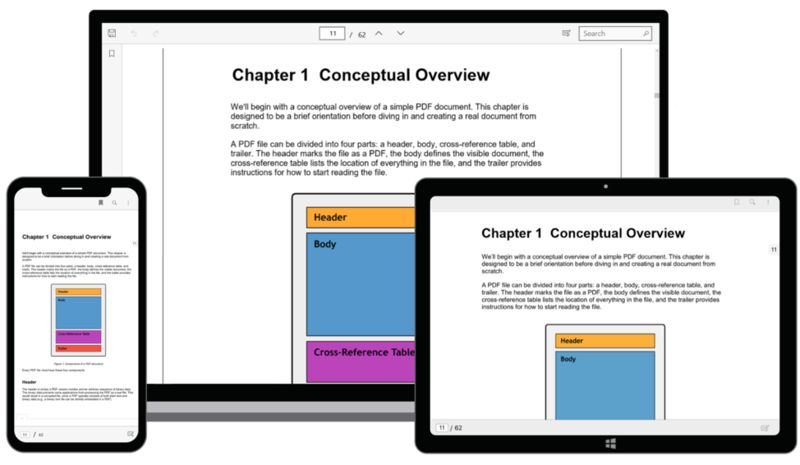 You can also display PDF documents using the web view control, though this approach does not work out of the box for Android and Windows platforms. Both approaches only provide a basic PDF viewing experience. They do not provide an optimal PDF viewing experience with features like document navigation, zooming, text search, text selection and copying, and annotations. Annotate PDF documents using common annotation types such as highlight, underline, strikethrough, freehand drawing or inking, line, rectangles, and ellipses. Easily navigate using bookmarks, links, and a table of contents. Select text and copy it to the clipboard. 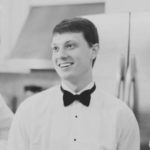 Fill and sign form fields. Load quickly: PDF pages are loaded on demand to help reduce the initial load time and memory consumption. Open Visual Studio and create a new cross-platform project with the name “HelloWorld” and choose .NET Standard as the code sharing strategy. 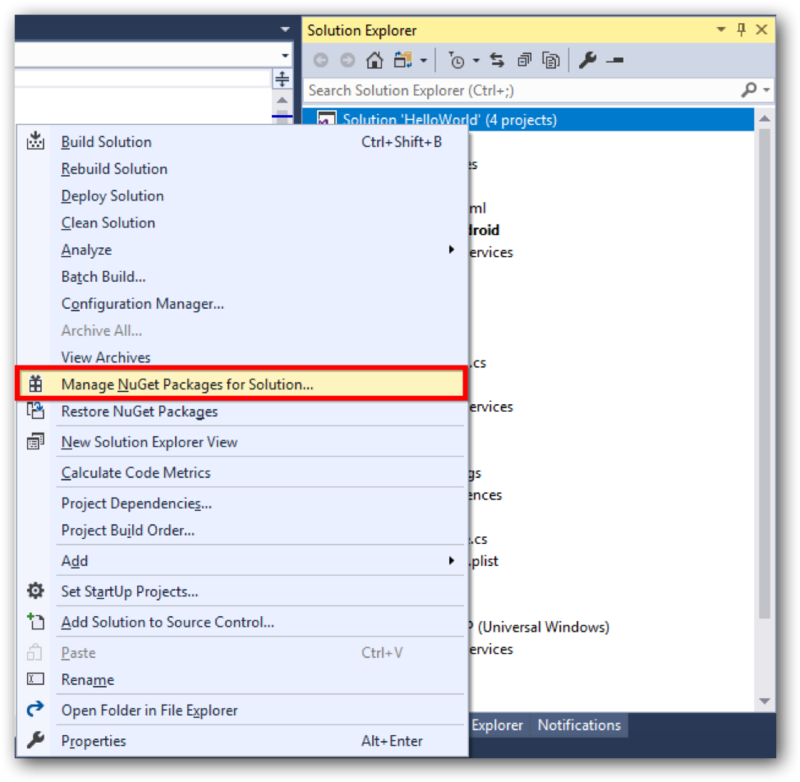 Open Manage NuGet Packages for Solution. 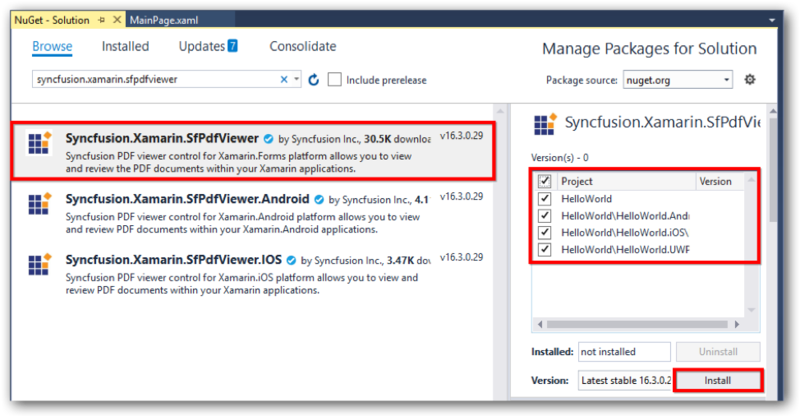 Browse for Syncfusion.Xamarin.SfPdfViewer NuGet Packages and install it to all the projects in the solution. Open MainPage.xaml and include the XML namespace to refer to the PDF Viewer assembly. Then add SfPdfViewer as the content to the ContentPage. The PDF Viewer supports loading a PDF document as a stream into it. In this blog post, we have added a PDF document as an embedded resource in the project to access its stream. 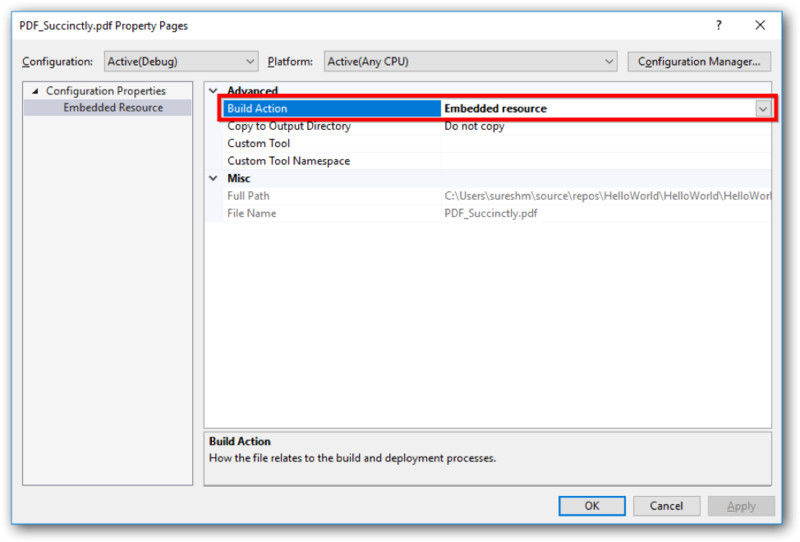 Add the document into the shared project and set its build action as Embedded resource in its properties. 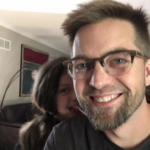 Add a view model class to the shared project. Here, the view model class is named PdfViewerViewModel. In the view model class, create a Stream object to bind the PDF stream to the InputFileStream property of the PDF Viewer. /// An event to detect the change in the value of a property. /// The PDF document stream that is loaded into the instance of the PDF Viewer. /// Constructor of the view model class. //Accessing the PDF document that is added as embedded resource as stream. //Unloads the PDF document from the PDF Viewer, releases all its associated resources. With this, you have successfully integrated PDF Viewer control into a Xamarin.Forms application. Now you can view PDF documents in Android, iOS and UWP platforms. Also, review PDF documents using various annotation tools available in our built-in toolbar. Add and modify rubber stamps and pop-up annotations. This post describes how to view PDF files within your Xamarin.Forms apps using the Syncfusion PDF Viewer control. You can find the runnable demo of this blog in this GitHub repository. To check out more features of Xamarin PDF Viewer, visit the feature tour page. 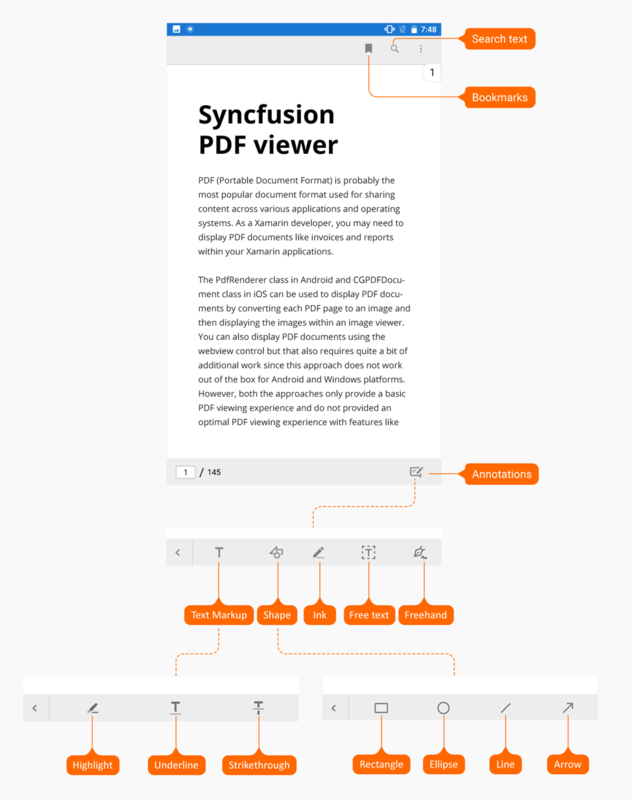 To learn more about the Syncfusion PDF Viewer, visit the documentation page.